Just as the recently released thriller THE GOOD NEIGHBOR is a spiritual descendent of I SAW WHAT YOU DID, so too does this year's HUSH draw inspiration from films of the past without being a true remake. In this case, the models are WAIT UNTIL DARK, a home invasion thriller in which recently blinded Audrey Hepburn has to fight off crooks looking for a doll filled with stolen heroin, and HEAR NO EVIL, in which Marlee Matlin plays a deaf woman being stalked by a dirty cop searching for a stolen coin in her apartment. 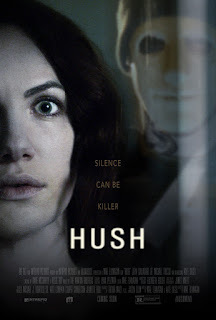 In HUSH, the masked killer stalking deaf/mute mystery writer Maddie Young (Kate Siegel, who also co-wrote the screenplay) has no such clear motivation. He's cut more from the cloth of modern slashers of the sort found in FUNNY GAMES and THE STRANGERS, strictly out for homicidal kicks. After dispatching Maddie's neighbor only a few feet away from Maddie as she sits typing on her computer, The killer (John Gallagher, Jr.) realizes she can't hear. He figures this will give him even more opportunity to sadistically toy with his next victim, but Maddie proves to be far more resilient than he imagined. There's not much to HUSH beyond an extended game of cat and mouse, which explains its relatively short (81 minutes counting opening and closing credits) running time. Nothing wrong with a lean, efficient thriller, and parts of HUSH work on that level. But as often happens in thrillers of this sort, the plot relies on stupid behavior from characters who are supposed to be smart in order to move forward, and that's when I start to get annoyed. The main issue in that respect here comes at about the hour mark. But when you get there, you'll know the moment I'm talking about. Based on the almost universal positive reviews this film has been given, most viewers seem inclined to shrug it off. I couldn't. As with his previous feature OCCULUS, director Mike Flanagan shows considerable style and skill when it comes to creating tension. But he has also shown in both films a tendency to expect his strengths to cover up weaknesses in writing plausible situations, or exploring characters and themes in any real depth. It kind of worked for me in OCCULUS, where the supernatural, reality warping premise further helped cover up any narrative weaknesses. That wasn't the case for me with this exercise in more grounded horror. Like all of the non-"found footage" films released by Blumhouse, HUSH is polished and professional. And up until the moment I alluded to earlier, it's reasonably effective. Given that no less a horror icon than Stephen King has placed the film on the same level as John Carpenter's seminal HALLOWEEN, apparently it's effective all the way through for many. That, however, was not my experience. I'd certainly understand if you listened to Big Steve over me, but if you want my opinion – 2 out of 4 stars.